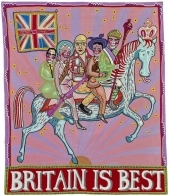 Winner of the Turner Prize in 2003, elected a member of the Royal Academy of Arts in 2012 and awarded a CBE in 2013, Grayson Perry is of the most well know, respected and recognisable of British artists at work today. Born in Essex in 1960, after completing an Art Foundation Course at Braintree College, Grayson studied for a BA in Fine Art at Portsmouth, graduating in 1982. 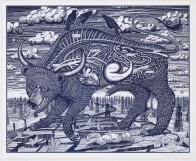 Perhaps initially best known for his often controversial pottery, his commentary on modern life, its injustices and hypocrisies has transcended into many forms, with his incredible large and powerful tapestries being at the current fore. 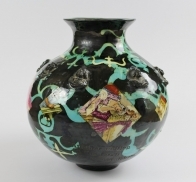 His commentary on aspects of society, including child abuse and natural disasters, the juxtaposition of such narratives being carried upon the traditional and familiar forms of pottery, adds to the impact. Other elements appear within his work, including references to transvestism, a somewhat autobiographical link to his own alter-ego, Claire. 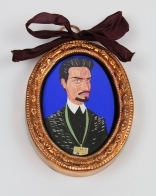 Exhibitions of Grayson’s work have been held at the National Portrait Gallery, Musee d’Art Moderne, Andy Warhol Museum and the Barbican Art Gallery, amongst many others. Grayson Perry delivered the memorable Reith Lectures on BBC Radio 4 in 2013, and has been the subject of two notable recent TV programmes, the BAFTA winning Channel 4 In the Best Possible Taste, and receiving a second BAFTA for Grayson Perry; Who Are You?